2. 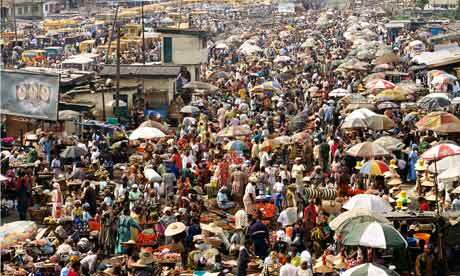 Full scale image shown of: Nigeria overcrowded street. Picture Category: HumanOverpopulation Africa . Step 2 preview: Inspect images to brighten up your eCard. One full size picture will be shown after clicking on a hyperlink from a list below. The Art, Pictures, Photo's and Animations contain images with the digital format: GIF or JPG or PNG. Where do concerned visitors of WisArt website originate from? From all over the world: below, you can see the flags of their countries. This page has started with counting flags from 14 November 2015 onwards. We invite you to find ethical solutions against the destructive effects of human overpopulation on nature. Please send your advice (possibly in the form of a slogan) to email address: feedback @ sthopd .net (anti-spam notation). Political & Artistic Greeting cards. Please Save Nature. International free artistic and politically independent eCards website. Politically incorrect and controversial messages on stopping mass extinction of Flora and Fauna. For better worldwide communication, we use international English. STHOPD: Stop Terrible Human OverPopulation Disasters.